One thing I love about blogging and writing is “meeting” other business owners. A few months ago I crossed paths with a lovely lady named Laura van Rooij. Laura designs custom bridal gowns in her shop Laura van Rooij Bridal Couture, located in the Netherlands. 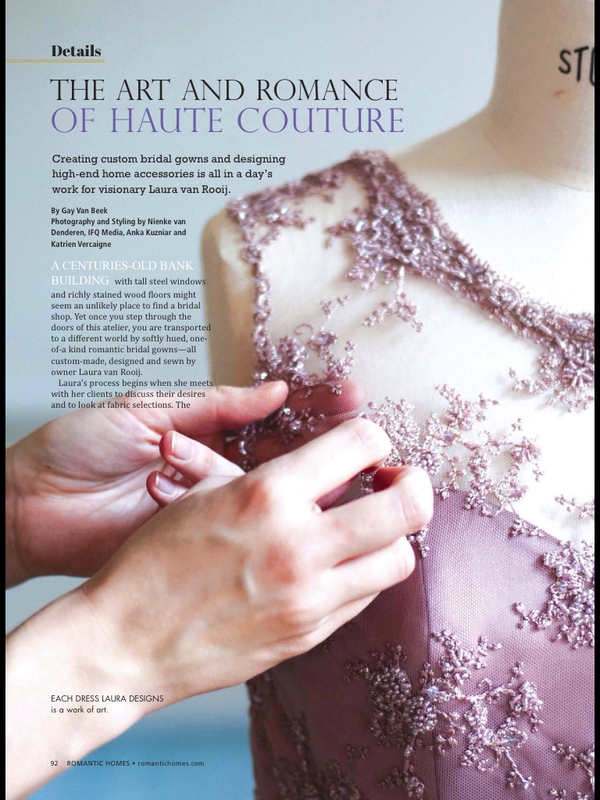 I wanted to share Laura’s story in the February issue of Romantic Homes Magazine. February is the month of romance and love, and what’s more romantic than a wedding? Here is the complete text with many more photos of Laura’s work. 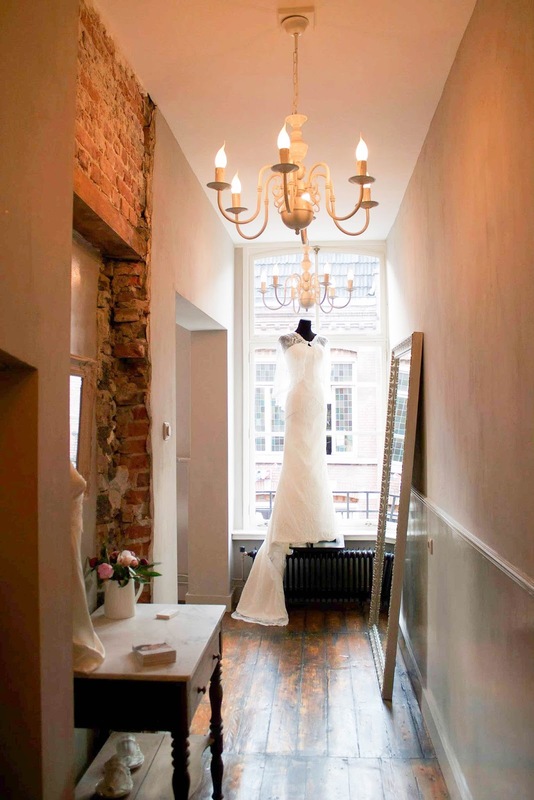 A centuries-old bank building with tall steel windows and richly stained wooden floors might seem an unlikely place to find a bridal shop. 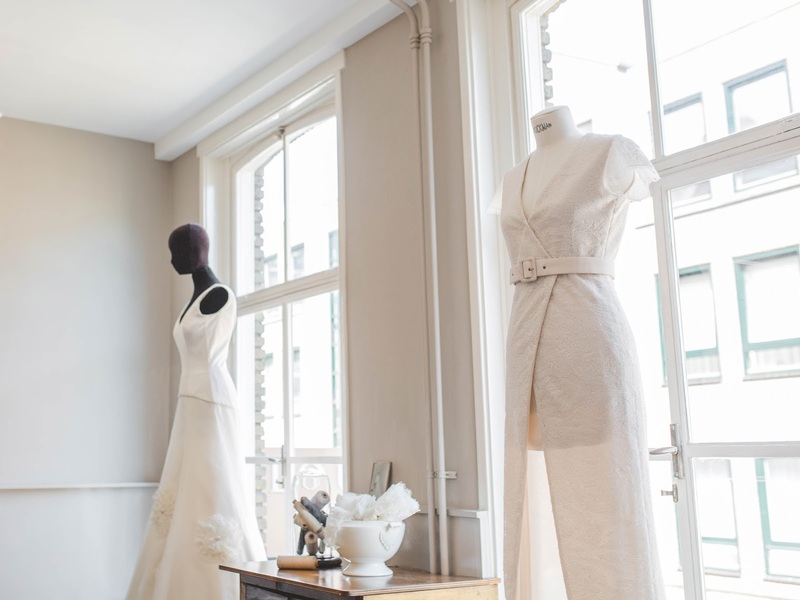 Yet once you step through the doors of this atelier you are whisked away by softly hued, one-of-a kind romantic bridal gowns – all custom made, designed and sewn by owner Laura van Rooij. Laura always knew she was born to design. Though she struggled with academics in school as a child, she had a gift for drawing and was captivated by the fashion she found in magazines. On weekend drives she would ask her parents to stop in front of bridal salons so she could admire the gowns through the windows. After graduating she attended fashion school and interned for a bridal dress designer for a short time, then moved on to selling high-end gowns at another salon. Laura yearned to put pen to paper and create her own visions. 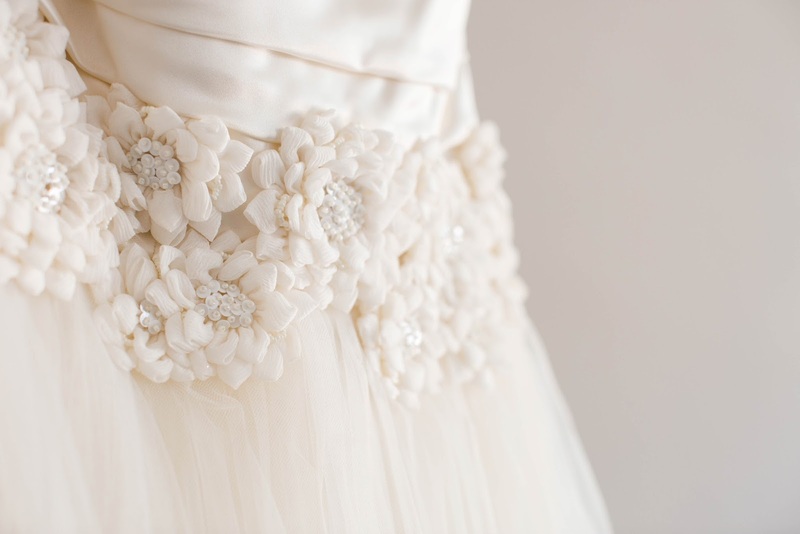 In 2010 her dream became a reality when Laura van Rooij Bridal Couture was born. Laura meets with her clients to discuss their desires and to look at fabric selections. The prospective bride-to-be tries on pre-made designs in the shop to see which silhouette suits her body and personality. This process is the starting point in designing a dream dress for the client. 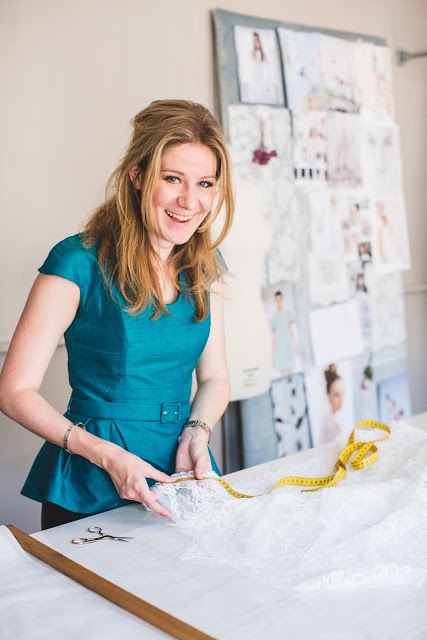 Laura then cuts a handmade pattern and sews a cotton “dress” that is used for fitting and adjustments. 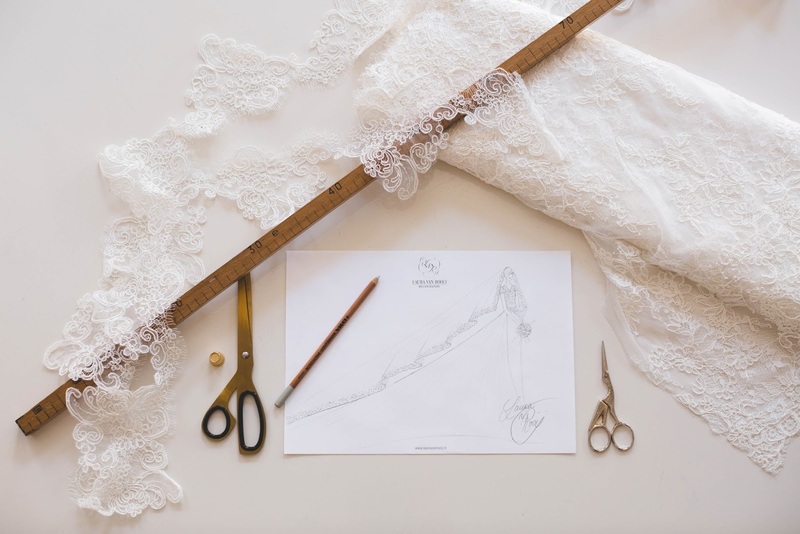 Once the fit is perfect then it’s off to the atelier where Laura herself cuts and sews the stunning, one-of-a-kind masterpiece. From start to finish each creation is from her own hand. 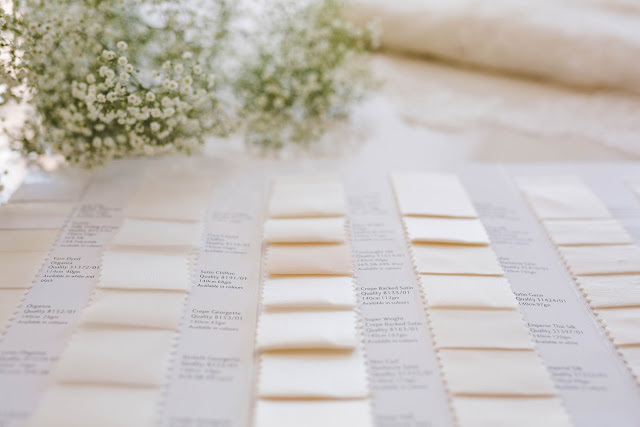 Searching the world for the best fabrics and accoutrements for her bridal creations is what sets Laura’s shop apart from other bridal salons. 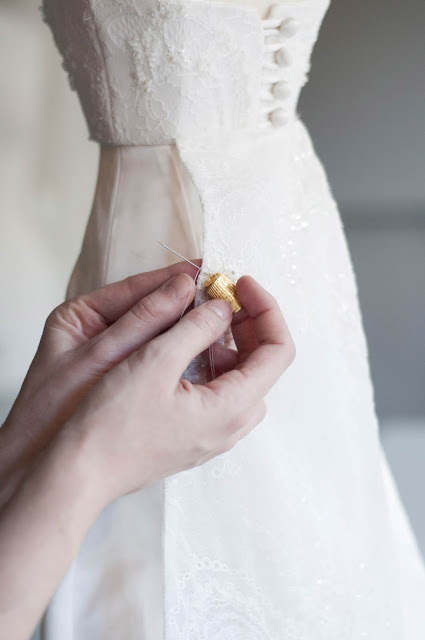 Quality and workmanship are top priority, as each gown is specially designed by her for the bride-to-be. In 2014 Laura moved her atelier to a magnificent old bank building located in Eindhoven, a city situated in the southernmost part of the Netherlands. Laura, along with her dad, lovingly restored the interior of the building while maintaining the charm and authenticity of the structure. 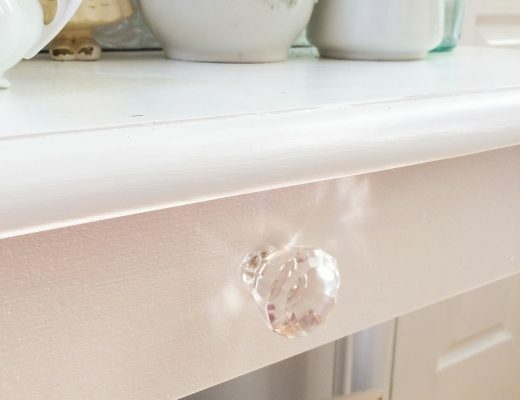 They shopped for old cabinets to display Laura’s fabrics, mirrors, lamps and beautiful small accessories. 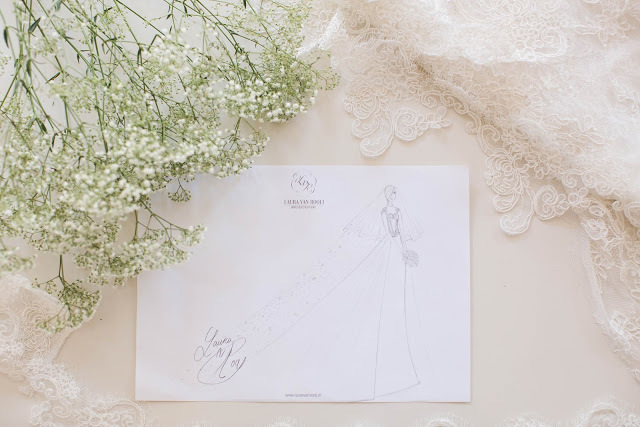 Her flair for design created a quite a stir with her customers; they not only appreciated her bridal designs, they also noticed her flair for interior design. 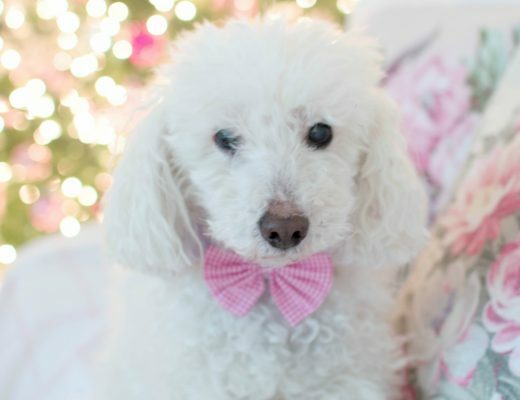 Her second business was born: Laura’s Living. 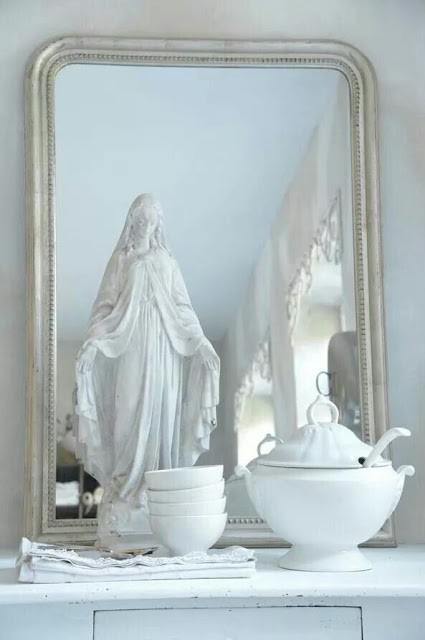 Her home decor items can be purchased on her website Laura’s Living and through Jeanne d’Arc Living. 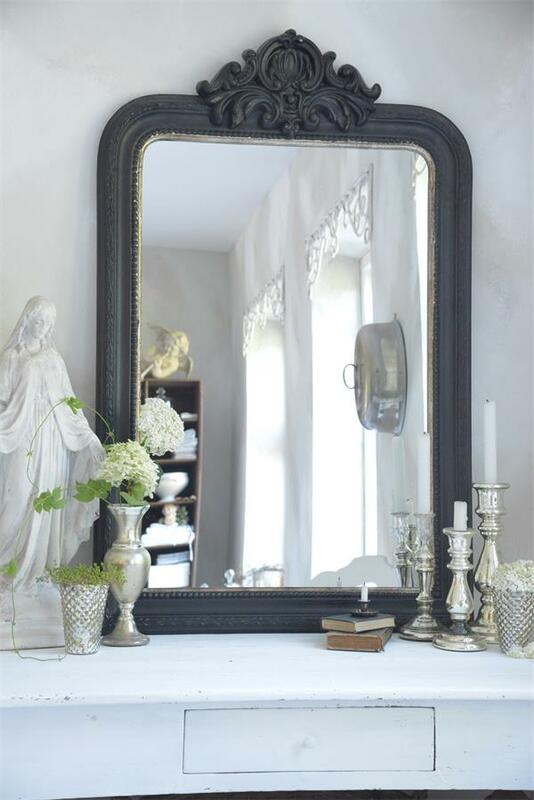 She carries high quality home accessories from large mirrors to smaller decor items like candles and pillows and has a gorgeous linen and lace tablecloth line made in Belgium. 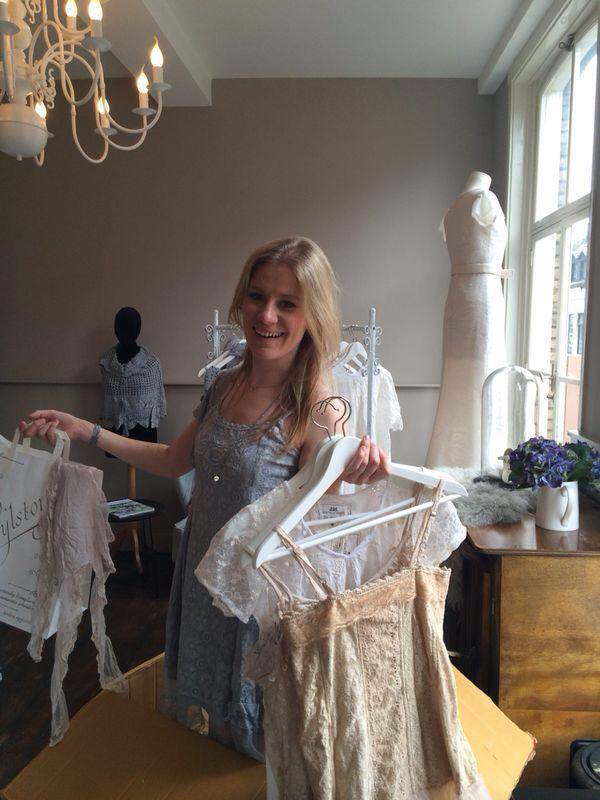 Each item is lovingly chosen by Laura and beautifully packaged. Details are very important to her and this is evident in every aspect of both of her businesses. 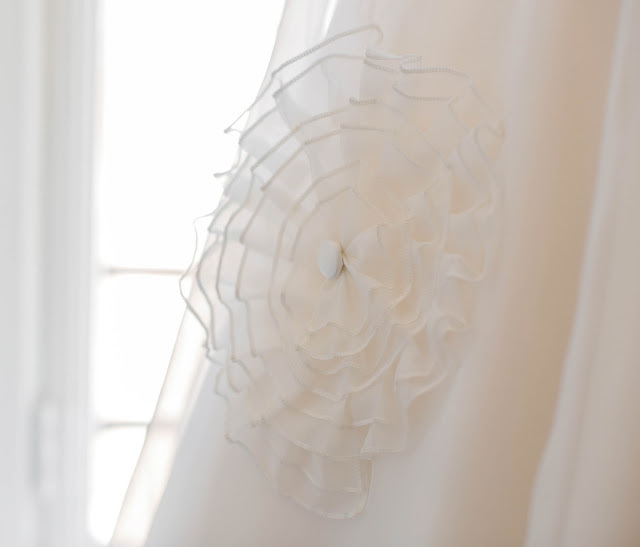 She has remained true to her vision of creating romance and beauty not only for the bride, but for the home as well. Each dress Laura designs is a work of art. You can follow her design process through this video: https://www.youtube.com/watch?v=AKo41ptQV6I. If you are interested in having Laura design a custom creation for you, please contact her through her website http://lauravanrooij.nl. 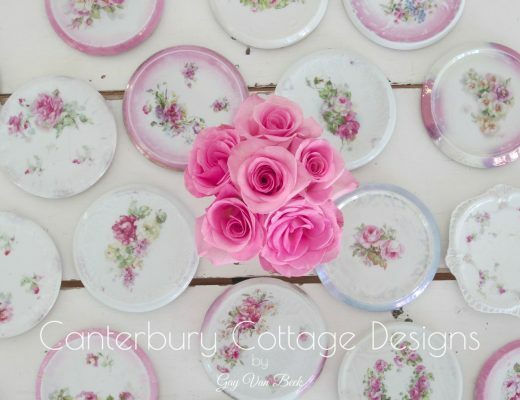 For home decor items, visit her website http://www.laurasliving.nl/woonaccessoires. 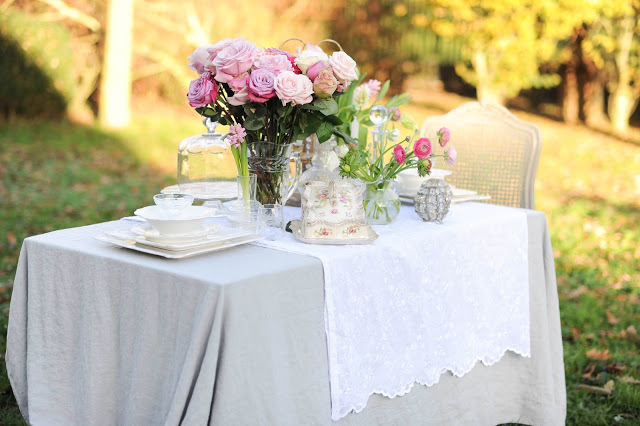 To purchase her linen line, visit www.pimlico.eu. 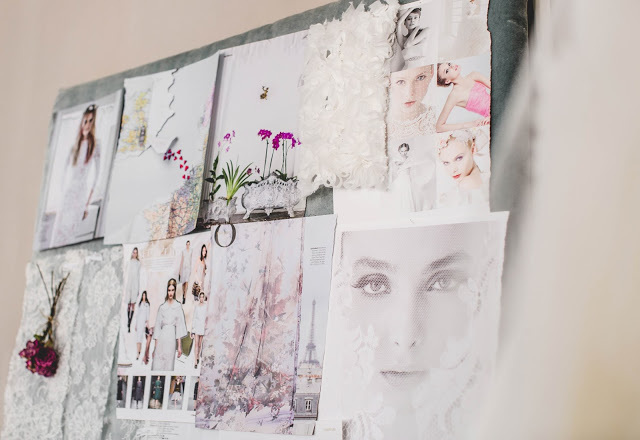 Laura is on Pinterest under the name lauravanrooij.nl; on Facebook under the name Laura’s Living, and on Instagram you can follow her home decor line @laurasliving, and her Atelier, @laura_van_rooij. Laura, what a pleasure it has been getting to know you. So gorgeous! Almost makes me want to have another wedding! I just found your site and feel so inspired by it. All posts and imagery are lovely! Thank you!